This off-season, very few reports have linked Mike Moustakas with the Red Sox. Most observers assume that Boston will either make a block-buster deal for Manny Machado (less and less likely an option) or take a gamble on youngster Rafael Devers for a full season. Now, however, reports are emerging that identify the Red Sox as a "sleeper" team on Kansas City's free-agent third-baseman. 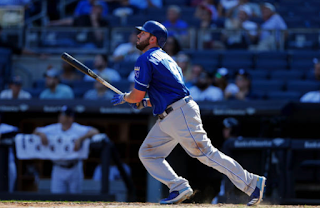 The favorites to land Moustakas remain the Royals, Braves, Cardinals, Mets, Orioles and Evil Ones. But, if Moustakas responds to the slow market by accepting a one-year deal, then Boston's chances will likely improve. Adding Moustakas and J.D. Martinez for 2018 would significantly enhance Boston's chances of challenging The Pinstriped Posers in the AL East.